If you are feeling generally unwell but the problem is not a medical emergency, call NHS Direct Wales on 0845 46 47 or visit http://www.nhsdirect.wales.nhs.uk/ for advice. Visit a community pharmacy for advice. Your pharmacist can provide free confidential advice and treatment without you having to make an appointment to see your GP. There are several pharmacies that are taking part in the “Choose Pharmacy” scheme (listed below). Please contact each pharmacy before attending to ensure that there is a pharmacist available. -eye problems such as scratches or something that is stuck in the eye. 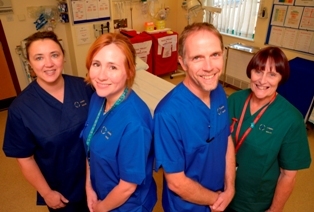 The Emergency Unit at the University Hospital of Wales , Princess of Wales or royal Glamorgan Hospitals assesses, treats and resuscitates patients who have been injured or are severely ill by appropriately trained and experienced staff, and refers patients as needed. If you would like more information on when it’s appropriate to attend the Emergency Unit or for a general guide to emergency care within Cardiff and the Vale of Glamorgan, please download our Unscheduled Care leaflet.